Handwashing with proper soap (bars not pump bottles!) Popular with shavers? What do we think about this rise of plastic pump bottled soap, rather than proper bars of soap? There is a big rise towards being environmentally friendly yet people still insist on buying these rubbish pump bottles now, a real shame in my eyes. Doesn't last as long, more expensive, worse for the environment (the bottles have to be re-cycled, heavier to transport etc). How many of you guys prefer proper bars of soap? I do, and I have bars of carbolic next to the bathroom sink and the kitchen sink, but my Mrs insists on her pump soaps no matter how much I object haha! Just wondered what you guys like. I might be on my own here, but I was thinking that because we are into grooming and shaving that we might look for the products best for our skin. I prefer handmade bars of soap. The natural glycerin content is good for skin, the stuff is soap rather than synthetic detergent, and the tactile experience of a bar of soap in your hands matters to me. Yardley on American store shelves is great for the price and a dramatic improvement over detergent bars or liquid "soaps," but I prefer handmade bars that I make or from small-scale artisan producers. I keep homemade liquid soap - true soap, not detergent - in the kitchen because it's easier when my hands have been handling raw chicken to pump the soap with an elbow than to try to pick up a bar of soap without also contaminating the dish and the area around the dish. I much prefer bars to bottles. Disregarding the waste of the bottle, bars are less expensive and last longer. And I have a miserable time regulating the amount delivered by the pump. Plus there is a much broader selection of scents. For showering, I primarily use artisan bar soaps. I'm the only one in our family who uses a bar soap, wife and kids prefer bottles. As OP mentioned, I've also noticed seeing less bar soaps in the aisle, less choices. Ime a soap bar tends to be more drying than liquid soap, and foams are prefered. Not all of them are good. I use a dedicated foam bottle and buy sulphate free liquid soap by the gallon. Soap bar in the shower for sure. Liquid for travel. Some liquid soaps are better than others, but 99% of them give me an allergic reaction - little blisters all over my hands. (05-24-2018, 01:10 AM)Goatywoaty Wrote: What do we think about this rise of plastic pump bottled soap, rather than proper bars of soap? How many of you guys prefer proper bars of soap? My bride and I are with you all the way. However, we do have to have a pump in the shower and one in the downstairs powder room for our son and his wife, who regard bars of soap the way they regard CRT computer monitors or telephones that have lines attached. Their two sons probably never have seen soap in bar form except in our home. For ourselves, we regard any sink (other than the sink in which we wash pots in the kitchen) that lacks a bar of Mystic Water Goat Milk “facial” soap alongside it to be naked and unpresentable to the civilized public. (begin off-topic ramble containing further off-topic tangents) Recently, we discovered a nice shower soap bar that bears a familiar brand: the brand is well-known by many readers of this board as an affordable but excellent shave stick, but LaToja is also a brand of excellent bar soaps. The LaToja Magno bar comes out of the wrapper pitch black, but after a few uses settles down to a very very dark green, similar to the famous Brunswick Green (10 gallons of black and a quart of green) used on the legendary Pennsylvania Railroad GG1 locomotives. (How many other vehicles in history have been so associated with a color as to make the color famous?) However, the LaToja Magno bar lathers up to a very white and creamy lather that rinses off completely when you want it to do so. I prefer bottles (liquid soap) - hand and body wash. I am also happy with certain brands - scent & performance. i use straight castile soap for my face and the shower. however, i have switched my kitchen to a glycerin foaming soap with no chemicals. We have a pump in the kitchen with a neutral soap (0% colourants, 0% perfume, 0% parabens), for when the hands are to dirty or too greasy to deal with a bar or a non-pump bottle. In the bathrooms we use Dr Bronner in liquid form, but without a pump. Bars are for the shower or tub. Aesop has "Reverence Aromatique Hand Wash" bottle with finely milled Pumice. I use during the "cold and flu season" (exfoliates the germs away ?) and extra dirty hands. My "other bottle" in the bathroom. Aesop also has matching scent hand balms. Bar soaps for me unless I travel. Stirling has great soaps and I use often but currently use Yardley due to ease of obtaining and price. They are also surprisingly good soaps and very affordable. Bar soap for shower duty, pumps for the kitchen and bathroom sinks. We have refillable pump bottles that take 2/1 water to soap and make foam, so they last a bit longer than a single use bottle. These are much friendlier to guests than a bar soap. I'll continue the semi-off topic ramble with a big thumbs up for La Toja bar soap. I have a stash in inventory that I rotate in and love the stuff. SWMBO and I have his n hers niches in the shower. I am anti-pump/anti plastic and have my shampoo bar and body bar perched on wood racks that I scrub every so often to keep the soap build up off. Either she has more hair so she needs more stuff or I am just naturally handsome and get by with a bare minimum. Or I have a bare minimum of hair so any more potions won't really help anyway. (07-03-2018, 10:04 AM)BrentS Wrote: I'll continue the semi-off topic ramble with a big thumbs up for La Toja bar soap. I have a stash in inventory that I rotate in and love the stuff. Brent, somehow I missed your excellent contribution to this thread now more than seven weeks ago. Those innocents who have not encountered La Toja Magno bar soap don’t know what they are missing. It is a unique toiletry that has no counterpart. But — more — I wish to compliment you on your shower architecture. It is stunning and (to use the proper Japanese adjective that unfortunately has no direct cognate in English) it exudes しぶい。 (Depending in the romanization system, しぶい usually gets transliterated as shibui or sibui; the adjective denotes restrained in an almost ascetic sense of understatement that reveals inner elegance and grace. しぶい is always used as a compliment: there is no badしぶい.) 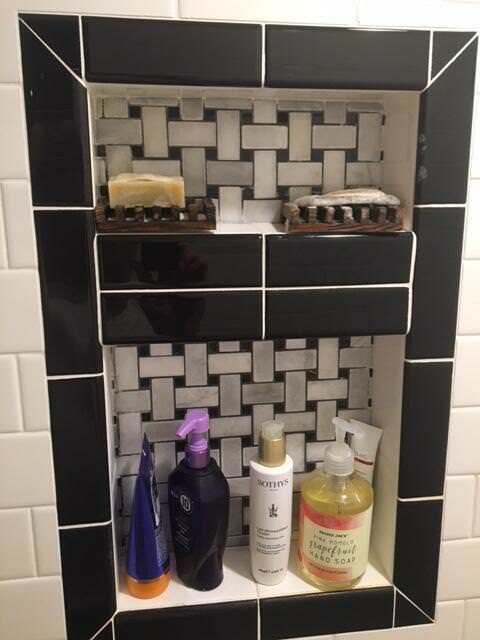 Did you do the tile work yourself? Since learning about high quality ingredients / high quality shave soaps, I’ve become more interested in using bar soaps rather than liquid from a pump. I’ve been using Dr. Bronner’s (their toothpaste is aces, btw) bar soaps and have been very pleased. I also tried Stirling soap bars, but found they don’t last as long as Dr. Bronner’s soaps. I just received an order from Shannon and will be trying her Plain Jane soap later today. Quite looking forward to trying this, as her shave soap is top shelf. I use bar soaps in the shower, but for the most part am still forced to use the liquid stuff for the sinks. Not my decision per se. (08-27-2018, 07:21 AM)WetShavingProducts Wrote: I use bar soaps in the shower, but for the most part am still forced to use the liquid stuff for the sinks. Not my decision per se. Buy bar of soap, place on sink, use Job done! I'm all about the bars. Much prefer than pumps. They don't last nearly as long as shave soaps so it gives me plenty of opportunity to explore many different types over the year. Just this past weekend bought an artisan vegetable based bath soap at our open air market. Not the best but very gentle and had a nice scent, Tobacco and Bay Leaf. Some of the Portuguese soaps have been good as well. Oh and Mitchell Wool fat. Man that is nice soap in the winter months.